It’s been another challenging and busy month, both creatively and personally. Since recently passing my driving test it was time to purchase a ScannerMobile to drive around in and take such challenges as driving on a motorway for the first time. And yes I survived, as did everyone else on the road thankfully. It now means a life outside of a big city is more accessible than ever and I can travel to events further afield. My new album Vex came out on 26th September. Even for my eclectic catalogue of works it’s quite a unique recording too. 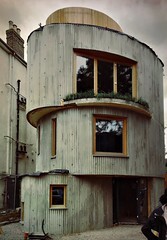 Back in 2012, architects Chance de Silva approached me to collaborate with them on their project Vex, a curved, fluted, in situ concrete house in London. With their buildings they always collaborate with an artist, be it a photographer or sculptor and this time decided that sound should take a key role in the development and structure of the house itself. This album then is an adaptation of the permanent and expansive sound installation that exists within the frame of the building itself. Initially inspired by Erik Satie’s Vexations (1893), the composition that was the starting point for the architecture design itself, the final soundscape focuses more on the environmental sounds of construction, the physical pouring of the concrete and so on. It’s truly musique concrete! Two of the pieces are edits of the full-length extensive work, plus a special mix made for showing our work in the Venice Architectural Biennial in 2014. You can buy the CD for a reduced price until 3rd October when it rises to normal price. Both MP3s and Wav’s are also exclusively available at the Scanner Shop. iTunes and other digital shops will be selling the MP3s only soon, so please buy any product here where any funds get closer to the source. Shop here. Stay tuned too as there will be a series of live performances within the house itself in the next months. We had over 1000 visitors to the opening weekend so it’s proving to be very much in demand. Here’s an interview with Steve and Wendy the architects and myself regarding the project. I frequently work in collaboration and I am very proud to have worked with artist Aura Satz on a couple of film projects. So from 1st October anyone in New York City can experience her recent work Between the Bullet and the Hole at the Fridman Gallery which I scored and designed the sound for. Between the Bullet and the Hole is a film, co-commissioned by the Dallas Contemporary and the Sydney Biennale, which focuses on the elusive and complex effects of war on women’s role in ballistics research and early computing. The film combines new and archival high-speed bullet photography, schlieren and electric spark imagery, bullet sound wave imagery, forensic ballistic photography, slide rulers, punch cards and computer diagrams. Like a frantic animation storyboard, it explores the flickering space between the frames, testing the perceptual mechanics of visual interpolation, the possibility of reading or deciphering the gap between before and after. Truly, it’s a work that only best be experienced by viewing it in a gallery space, so hope that some of you may get to see the show. I’m off to Milan Italy for the first week in October for the If Italians Festival. This is going to be a very entertaining sonic adventure, as I’m performing live with Italian musician Painé Cuadrelli on a new project, Signals and Signs. We have created a new surround-sound work that utilizes all the sounds around us that have been designed for our environment, from news idents, metro announcement sounds, microwaves beeps, ringtones, and many more. We are sampling and mixing this up into an entirely new work. On 14th October I’m then presenting more new work at the National Portrait Gallery in London to launch their new Choral Audio Guide, as part of their Surround Sound evening event. I’ve deconstructed several of the works and created new variations on these choral pieces in my own inimitable style, five new works in five separate galleries. It’s a free event so hope that some of you can make it along that evening. Public Record opens at Ipswich Museum on 25th October, as part of Spill Festival 2016. I’m working with American writer Justin Hopper who lives on the Essex/Suffolk border. His work explores the intersection of place, memory and myth and for our project he’s writing new work that refleects upon the ghosts of the museum, the unseen connections and subtle hauntings of the gallery space. I’m composing new work that will be heard on headphones, accompanied by readings of the texts, resurrecting forgotten lives through texts and objects. It’s set to be a beautifully affecting and magical work indeed! It runs until 29th October. As part of DRILL London in 2013 I was delighted to be invited to collaborate with Elizabeth Bernholz otherwise known as Gazelle Twin. In conversation we decided that I would completely rework her cover version of the Wire tune, Heartbeat, given that the festival was curated Wire. As such the live show at Cafe Oto in London featured Elizabeth secreting herself in the audience whilst a rather unsettling video played behind me as ‘we’ performed together. It became an emotive wall of mirrors as I completely reworked her cover of the Wire song. The resulting tune was expansive, so here’s an 18-minute version edit of the live performance for you to enjoy. Download it here and keep it for yourself now. Many of my dance collaborations are currently touring which is thrilling. At present Pattern Recognition is moving around the UK, whilst my score for Russian ballet stars Natalia Osipova and Sergei Polunin continues at Sadlers Wells at the time of writing. Tomorrow with Rambert Dance is currently touring the UK and in November Alice based on Alice on Wonderland begins playing in France, choregraphed by Josette Baïz & Groupe Grenade. Having worked with choreographer Lucy Guerin on Tomorrow with Rambert Dance, we have begun a new collaboration entitled Split. In Split, Melanie Lane and Lilian Steiner, two of Melbourne’s most enigmatic dancers, negotiate ever-diminishing dimensions of space and time. With delicacy and complexity, this dance revels in Lucy Guerin’s pure choreographic elements, unfurling a mesmerising drama.The soundtrack in a new work, reductive and minimal in character, offering up a thought-provoking structural meditation rendered in movement. Split is scheduled to premiere in March 2017 in Melbourne. For the moment you can watch a clip of the work in development here. Outside of making sound I’ve always found profound pleasure in writing and have begun regularly writing for new British magazine, Electronic Sound, available as part real print, yes a real magazine that can be found on the shelves in shops, as well as digital, quite naturally. For my first feature I’ve written about the big question of recorded music and questioning the need for it to having ever exist in recorded form or not. With reference to the Rijeka Airport project it touches on the Edison phonograph cylinder amongst other things. Next issue I’ve written a very personal think piece about silence. Playtime in the studio, in between projects, is always rewarding. Here are a couple of new pieces. 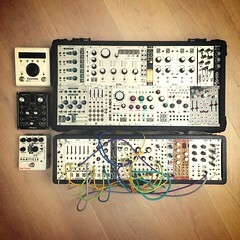 Complex and Ears, both of which began as explorations using new Eurorack modules in the studio. Synthfest takes place on 1st October. Created by Sound on Sound magazine, there will be retailers, a Modular Meet Camp, Seminars and Q&A Sessions, one of which I will take part in regarding getting started with a system. You might also find me taking care of the Ross Lamond table as I like to remain hands-on at such events so please come and say hello. Continuing this synth focus I was also delighted recently to appear in a major press feature regarding the usage of modular synths in composition and creativity, so you can me nudged comfortably up against Alessandro Cortini. John Chantler, Floating Points, Surgeon, Richard Devine, Kaitlyn Aurelia Smith and Lichens. I’m still blushing. Read it in full here. I made a very special one-hour DJ mix for Decoded Magazine here. Accompanying an interview offering an up to date summary of past and new projects, you can download the full mix at Soundcloud that features work from many of my favourite musicians, including Abul Mogard, Carl Stone, Clock DVA, Severed Heads, David Toop, The Hafler Trio, Robert Fripp and many others. Treat yourself here. Any folks in Paris should be aware that I will be presenting my work there in November at the legendary Université Paris-Sorbonne in November, for the opening of Festival des ides Paris. Tickets are free but reserve them in advance to be certain of a seat. It will be a dear pleasure to visit this delightful city again! Book tickets here. So until next month, happy listening. A collaboration with American writer Justin Hopper that refleects upon the ghosts of the museum, the unseen connections and subtle hauntings of the gallery space. Listeners use headphones to navigate their way through the collection through music and words.